4th Nov 2013, 12:01 AM in No place like home. As for Jolly, this has been going on since he encountered the spirit of Endon in the cave. Contact with the spooky stuff drained his life a little, even Noks friendly pat on the back left its mark. Depending on the person, grey hair can make them look either distinguished and respectable or just old (according to 3rd Rock from the Sun, anyway). A touch of gray can be a good thing, but as with anything else, moderation is key. That looks like the side effects of something. 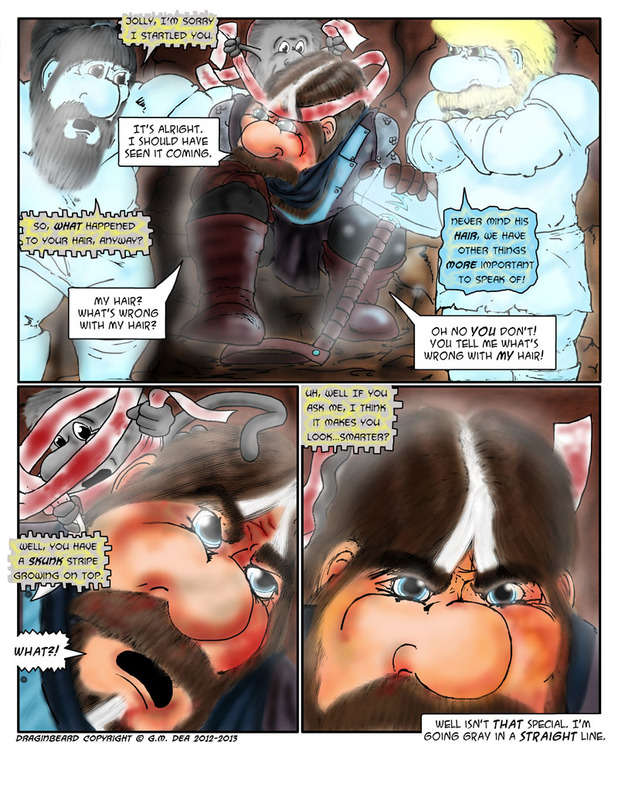 Life drain, and speed healing can take its toll on a Dwarf. Wikipedia said when someone's hair turns white overnight after a stress, it's because they already have plenty of grey hair but brown ones still drown them out, then the stress ticks off their immune system and since melanocytes are an easy target dark hair follicles become inflamed and those hair fall out, leaving only the white. Scalp Parasites...never will you see them in my comic, unless they are giant, Kung Fu crazed Scalp Parasites from the Avocado Jungle of DEATH! Death Touch and magic healing is all it takes to get your gray on around here! "You tell me what's wrong with my hair!" Lol, I think it gives him character. Its a small moment where I thought, how happy would I be if something like this happened to me? Probably not much, but then again I could get used to this easier than suddenly going bald over night. Funny he hadn't noticed it yet, I suppose he hasn't had time to admire himself in the mirror lately. I for one think it looks charming! Yeah, there hasn't been time, and to be honest, there hasn't been anything he could see his reflection in. Stonearm and Nok aren't quite as funny as Cizors and Leerpain, but oddly enough their dialog comes very easily to me. There are times when both pairs are all talking in my head at the same time, and mostly it involves Leepain and Stonearm threatening each other, while Cizors and Nok kind of just throw in the odd comment. He's sporting the "Peppy Le Pew" or Rogue from the X men look. Probably a good mix of both, although Rogue has way better hair than Jolly does. Heh, Jolly is going to need find a supply of 'Just for Dwarves' hair coloring! Now with the Pepe Le Pew jokes! =D That's right, NOTHING is sacred! Ugh...I have a hard enough time drawing hair as it is. Still, pony tail Jolly... Nok's doesn't look too bad on him. Maybe Jolly will go for the look one day too. Same for me. I would look pretty creepy bald.